GI Technology Private Limited (GIT) was established to realize the Great Indian Dream of improving the standard of life of every aspiring Indian. We aim to provide the hundreds of millions of underbanked Indians, who do not have the ability to make payments online with a credit card or to transfer money from bank account to bank account, with a safe and convenient solution to use their cash for online purchases and money remittance. GI Technology is the issuer of iCASHCARD, India’s leading prepaid payment instrument (PPI) further to a license granted to GIT by the Reserve Bank of India (RBI) on 29 October 2009. Today, hundreds of millions of people in India don't have bank accounts. For most, this is because they don't have steady jobs or regular income, no government-issued ID or if they live in rural areas, they may not be within walking distance of a bank or may not be inclined to trust big institutions like banks. Who they trust are the people they know; their friends and family - and the small shopkeepers from whom they regularly buy goods. In partnership with our associated company Hermes I Network Private Limited we have thus established a nationwide network of retail points where iCASHCARDs are distributed and can be recharged with cash. 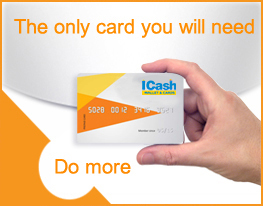 iCASHCARD is also being distributed by other partner networks numbering more than 100000 agents across India. Further iCASHCARDs can be topped up at leading banks through special pay-in slips and also through the icashcard.in website or by mobile using common internet and mobile payment options. We provide more than 200000 people daily with access to affordable financial services and other related services and through our retail network partners offer tens of thousands of retailers the opportunity to earn extra money by driving financial inclusion in India. We are proud that in 2014 GI Technology was named "Winner Financial Inclusion through Innovation" at India‘s Financial Inclusion Conference and was awarded the National Payments Excellence Award 2014 by the National Payment Corporation of India (NPCI) for being the largest processor of Immediate Payment Service (IMPS) payments in India in 2014. GI Technology is also serving India’s financial services industry including banks and NBFCs with innovative wallet, prepaid, remittance and eKYC technology solutions. Over the last years we have issued on our platforms more than 35 million accounts for various financial institutions.